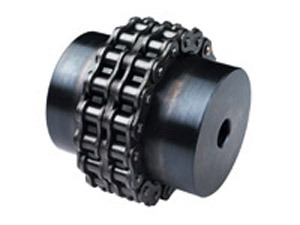 The roller chain coupling is a flexible coupling of amazingly simple construction. It consists of a combination of one coupling chain and a pair of coupling sprockets. Flexible and strong, the Tsubaki Power Transmission, LLC. roller chain coupling is suitable for a wide range of coupling applications. Torque is apportioned over the whole roller chain and all sprocket teeth, and is held at a point close to the outer diameter of the sprockets. This construction and the superior qualities of U.S. Tsubaki roller chain combine to make a compact and lightweight coupling.